This post is #sponsored by Chamberlain. We were paid for this post and received the featured Home Bridge as compensation. These affiliate links are not associated with Chamberlain. Have you ever wished that your garage door opened automatically as you pulled your car up the driveway? Ever woke up in the middle of the night and realized that you left the garage door wide open or been sitting at work wondering if you had closed it after you drove off that morning? Or, do you have kids who take their bike to school after you’ve already left for work and, though you’ve told them a dozen times, you’ve come home more than once to find the garage door sitting wide open? How about, have you ever had a friend or family member that was dropping off some things and wish that they could just put it directly in the garage? Conversely, ever have someone come by to pick something up and have been forced to leave it by the curb since you were at work and didn’t want to leave the garage unlocked the whole time? Perhaps you crave better security. I mean how nice would it be if the entry lights turned on as you pulled into the garage or the garage door automatically closed as you walked into the house? How about if you received an alert if your garage door is opened and you weren’t the one who opened it, at night while you were asleep upstairs or in the day while you were at work? Wouldn’t some better control of your environment be great and wouldn’t it be great if it tied into your smartphone since you always carry that wherever you go? If you’ve said yes to even one of those, a Chamberlain MyQ® Home Bridge with Apple HomeKit™ functionality might just be the answer you didn’t realize you were asking. In this post we’re going to explain why you need one, guide you through the initial Chamberlain MyQ® setup and do a mini Chamberlain MyQ® review. 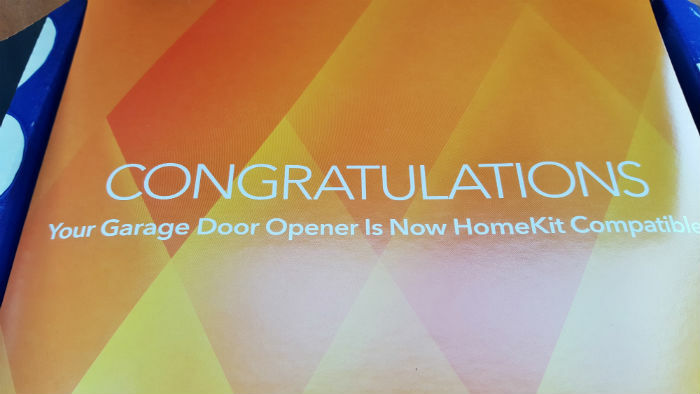 If you already own a MyQ® Chamberlain garage door opener and don’t have HomeKit™ functionality, I’m here to let you know what you’re missing. The same goes if you have an older garage door opener and want to jump on the ridiculously fast moving freight train that is taking place today in home automation. 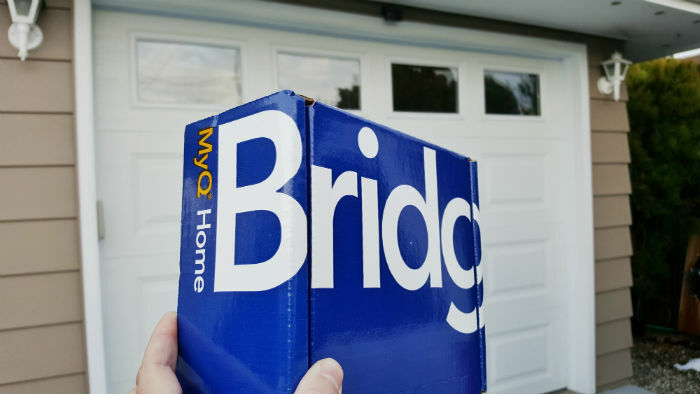 If you want to connect your existing devices to the MyQ® Home Bridge you’ll either need a MyQ® garage door opener or a MyQ® light switch. You can also easily convert your post 1998, non MyQ® enabled LiftMaster Security+ with a MyQ® Door Controller as well as several older garage door models. If you already own the MyQ® Internet Gateway, you have an inkling of the capabilities of the power of MyQ®, now with the MyQ® Home Bridge, you can replace it and get full Apple HomeKit™ support. That’s right, you can now just tell Siri® to close the door or ask if it’s open. 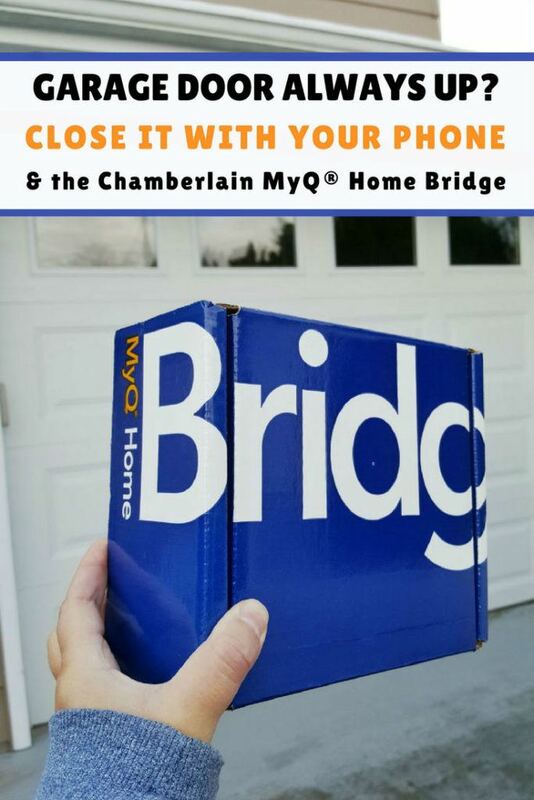 The Chamberlain MyQ® Home Bridge is a hub like device that connects your MyQ® enabled devices to connect to the internet as well as your smartphone. It will also act as an intermediary between other MyQ® devices. 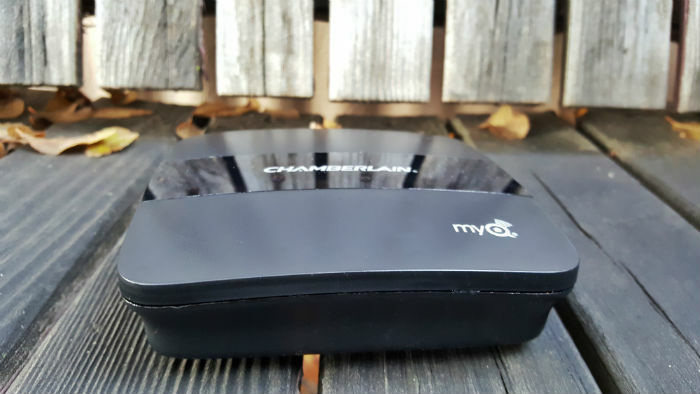 For Chamberlain, that connectivity begins with MyQ®, and that’s the name they’ve given to their wireless technology that lets you remotely control most of their newer devices. I can get all techy and say things like it runs on the 900 MHz spectrum and operates in the 2.4 GHz WiFi space and that it can integrate with dozens of products and technologies however the truth is you probably don’t need to know all that. All you need to know is that if you have a Chamberlain MyQ® garage door opener, MyQ® gate or MyQ® light then all you need to take your home automation worries to the next level is getting a Chamberlain MyQ® Home Bridge. Once you have the slightly bigger than palm sized device, setting up your MyQ® Home Bridge is a snap. Full outright disclosure, we’ve owned 2 Chamberlain MyQ® garage openers for a few years now and never got the older MyQ® Gateway. Since our openers were MyQ® enabled but didn’t have the built in WiFi that today’s Chamberlain openers typically include, we needed the older MyQ® Internet Gateway to remotely control our garage doors. Though the Internet Gateway was well received, it still didn’t play as well as we liked with Apple products and since we’re mostly an Apple family, the MyQ® Home Bridge is a great first step into home automation. Once you set up the Chamberlain MyQ® Home Bridge, you can ask Siri® to open or close the garage door and even just ask if it’s closed. You can also open or close your MyQ® door via the Apple TV and pretty much any Apple or Android product from iPhones to tablets, as well as doing it online. That’s right, forgot or lost your phone? You can check if your garage door or light is left on via your browser. Even nicer, you can set custom alerts to notify you if you’ve left the door open too long. It’s handy if the kids forgot to close it or after you come home from doing a bit of late shopping. You can also program lights to come on and shut off from halfway across the world. How nice would that be to be able to close the garage door from the comfort of your bed or open it to your father in law as he decides to hang your Christmas lights for you early this year while you’re on your way to Hawaii for the week? Setting up the Chamberlain MyQ® Home Bridge is as easy as plugging it in, downloading the Chamberlain MyQ® app for your iPhone or Android phone or tablet and creating a MyQ® account. Once you enter your MyQ® Chamberlain login, you can then connect to your MyQ® Bridge. Your MyQ® enabled door opener or MyQ® light will show up as a connected device and you’re instantly set to open or close your doors. All the MyQ® Home Bridge needs to work is power and a semi decent WiFi signal. It can typically be anywhere in the house however it works best if located close to your MyQ® devices. Ours sits in our garage on the wall with the bracket Chamberlain includes in the package. 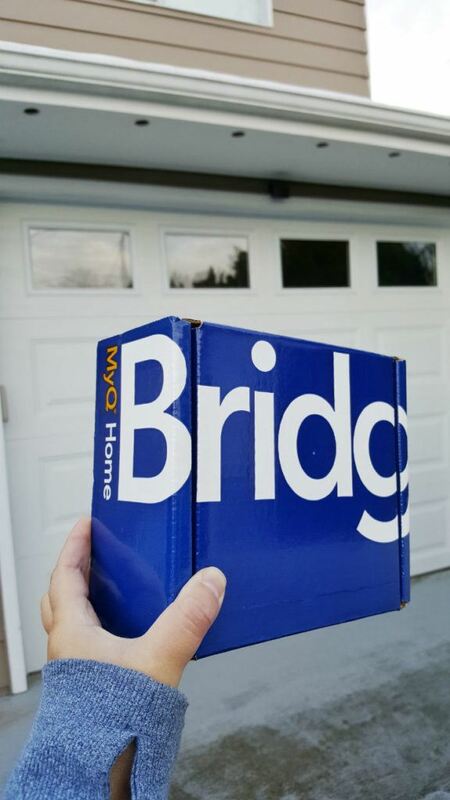 If you already own the MyQ Internet Gateway, all you need to do is plug the MyQ® Home Bridge in and when you first connect to it, the MyQ® Home Bridge will pull all the information for the devices directly from the old Gateway. Once that is done, you can disconnect the old MyQ® Internet Gateway since the Home Bridge will fully replace it. Note: When first connecting the MyQ® Home Bridge, ensure that your router is broadcasting in 2.4 GHz mode and that the smartphone you’re using is also on the same 2.4 Ghz channel. At home we use the 2.4 GHz as well as 5 GHz frequency and my iPhone on 5 GHz couldn’t see the Home Bridge until I reconnected it on the 2.4 GHz. Once it was setup, I could still control it via 5 GHz so it’s only a temporary step. Once you have your MyQ® Home Bridge connected to your network, you can then choose to include the MyQ® hub into Apple Home and your devices will show up there as well. At that point you can control your MyQ® devices directly via Siri® voice, via the Apple Home app or the MyQ® app. With Apple HomeKit™, you can even control everything from Nest® Thermostats to coffee machines. If you’re an Android user, you can connect the MyQ® Home Bridge to IFTTT or Google Home and Google Assistant if you purchase the monthly plan which costs around a dollar every month. With IFTTT you can set up the garage door to automatically close as you drive away or open as you pull into the driveway. You can also control how lights work in relation to your location around the yard and house. With Google Home you can ask if the garage door is open and if it is, close it on demand. With Google Assistant you can be anywhere in the world and control you MyQ® devices via your Android phone. With the free Chamberlain MyQ® app (available from the App Store here and Google Play here), you can set up phone notification alerts based on open or closed status and have your garage doors automatically close after a certain amount of time. You can also set rules for specific times or certain days. This way, if your door opens suddenly at 3 am you can get near instant notifications that your door has been opened. This is also the case if it happens at 2 pm on a Tuesday when you’re at work. Note: Android users don’t need to pay a monthly fee if all they want is notifications and the ability to open or close the door or control the lights if they use the free Chamberlain MyQ® app available from the Google Play Store. Easy plug and play setup, full integration with Siri® as well as Apple HomeKit™ plus a nice simple app on our Android phone make the Chamberlain MyQ® Home Bridge a quick hit in our house. With notifications setup for middle of night openings as well as when the door remains open for too long (which is perfect to help keep our garage warm in our cold winters and cooler in our warm summer months), we sleep better knowing our biggest door in the house is well guarded. I love that I simply have to ask Siri® if the door is open and ask her to close it if it isn’t. I don’t love that I need to enter my passcode or swipe my finger to open the door via Siri® but I understand why they did it (for security sake). Once Apple includes better voice recognition I imagine this caveat will be gone and I’m lead to believe that if you own an Apple Watch you don’t need that extra bit of security so that’s nice. That said, I love that I can open the door remotely in case a neighbor needs to borrow a tool or when I’m on the driveway and don’t have the keys to the car but want into the garage anyway. For that matter, I love that I don’t have to have the garage door remote in the car at all since our vehicle sits in the driveway most nights and if it got broke into I wouldn’t need to worry that they got into the garage via the remote hanging on my visor (which happened to both a cousin and a friend of ours). Most of all, having a Chamberlain Whisper Drive garage door opener is great for keeping the noise down in the house however I always felt it left us vulnerable in the fact that if our garage door somehow got opened in the middle of the night none of us would know it. Now I have the security knowing that something is watching over it and there’s no price too high for peace of mind or a good night’s sleep. For that reason alone, the Chamberlain MyQ® Home Bridge is a welcome addition to the family and is going to be just one small step into our personal home automation journey. Thanks Chamberlain for taking that first step with us! 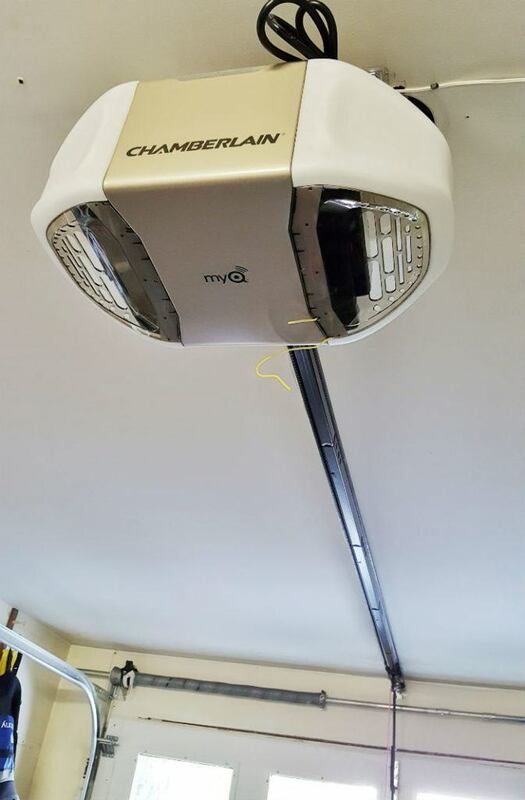 Learn more about the Chamberlain MyQ® Home Bridge on the Chamberlain webpage or check out their social media pages @Liftmaster on Instagram, @ChamberlainDIY on Twitter, @Chamberlain on Pinterest and @ChamberlainDIY on Facebook. If you’re thinking about picking up a Chamberlain MyQ® Home Bridge for Black Friday or Cyber Monday, then there’s a sale at Chamberlain’s website running from November 20th to December 14th including free shipping on all MyQ® Accessories (which includes Home Bridge, Smart Garage Hub, as well as Remote light controls and light switches). Just use Promo Code: Holiday17 as the introductory price of the Home Bridge is changing back on December 1st. Hello, thanks for introducing me to this. I love that it is so easy to use. It has made my work so easy. Now I don’t have to pick up heavy garage doors, my smartphone does it easily! I love the fact that you can monitor your garage door from your phone. That is fantastic.